The author shares recollections from his interview with the late author and activist. When I learned of the death of Myanmar writer and activist U Win Tin, I decided to wear a blue shirt for the day. The gesture, however small, struck me as a fitting tribute to Myanmar’s longest-held political prisoner, a man who vowed to continue wearing his blue prison shirt until all prisoners of conscience in his home country were released. He wore the blue shirt to his deathbed. 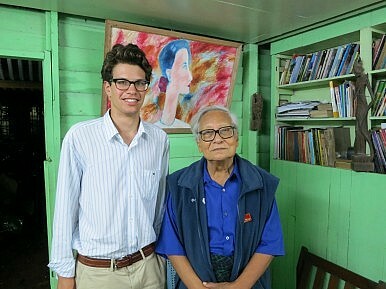 The enduring image I have of U Win Tin, or Saya (The Wise One), was of him standing – in his signature blue shirt – to greet me at his home in July 2012. I was 20 years old and had just arrived from Los Angeles on an independent research trip seeking to gain a better understanding of the reforms taking place in Myanmar. That first day had been spent running around Yangon trying to land an interview with senior leadership in the National League for Democracy (NLD). Win Tin was the first individual I reached out to, and over the phone he told me to come by his home later that evening. The first lesson Saya shared with me came before I even met him: nothing is ever quite as special as that first interview. Seeking shelter from the monsoon rains, Win Tin had me sit at a table in his modest two-room home, a palatial structure compared with his former prison cell. Over hot tea and biscuits, my education in Myanmar’s history, present struggles, and future ambitions began. Reflecting on the NLD, Win Tin remarked, “Up to now, we have no form of tangible young leadership.” Sometime between the NLD’s creation in 1988, mass imprisonments in 1989 following the 8888 uprisings, and subsequent crackdowns by the junta, the NLD’s leadership had become elderly. Throughout our discussion, Win Tin kept coming back to the topic of age, and his remarks made clear that more than a lifetime’s amount of work was required to achieve a satisfactory political situation in Myanmar. He outlined four key factors guiding the NLD’s leadership rejuvenation: “When we choose candidates, our first priority is women. We want to bring up the women’s community. Our second priority is youth, three is ethnic people, and four is incumbent leadership.” His determination to see the NLD live on in perpetuity was evident. It was, after all, his life’s work. On a cultural level, Saya justified his use of the “menace” descriptor noting that Chinese citizens who settle in upper-Myanmar “never quit their culture.” This ethnically deterministic nationalism had become an ever-increasing feature of his rhetoric up until his death. On this topic, his words continue to trouble me. Commenting on the political side of the Myanmar-China relationship, Win Tin noted, “The Chinese can be quite interfering. They will play very cleverly – deftly – because they are much more developed.” It is worth noting that his sentiments, irrespective of accuracy, have become part of a broader national narrative that views China’s actions in Myanmar with increasing suspicion. With U Win Tin’s death, Myanmar has lost its foremost tiger. Looking back at my time with Saya, and the words he shared with me, it is evident that he loved his country deeply because of its challenges, and not in spite of them. If we have learned anything from U Win Tin, it is that at one point or another – in all of our lives – we all wear blue shirts. The causes differ, the emotional scars vary, but the need to “speak truth to power” endures. Going forward, we are all left to fulfill Win Tin’s vision of a peaceful, inclusive and democratic Myanmar. With any luck, his blue prison shirt will become a distant memory with the release of the last political prisoner. But U Win Tin’s work – his legacy – will never be forgotten. Reid Lidow is an undergraduate researcher at the University of Southern California where he studies international relations and political science. He has conducted research in Myanmar on three occasions. He is a Gates Cambridge Scholar-elect and will pursue an MPhil in Development Studies at the University of Cambridge beginning this fall. Foreign assistance for training lawmakers needs to be more focused.